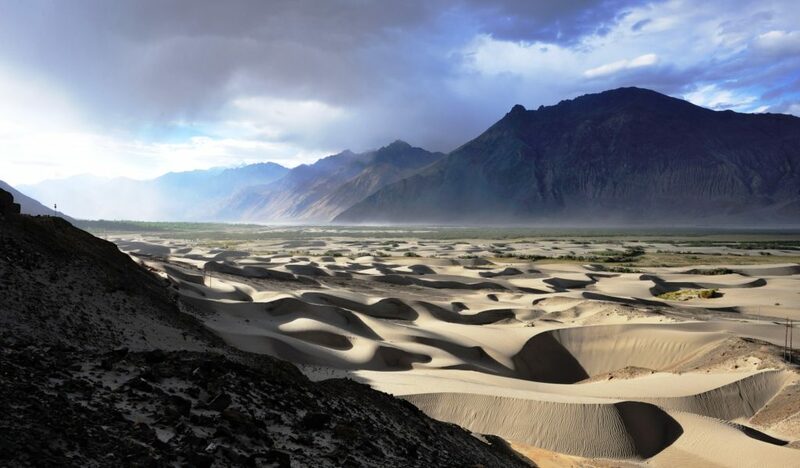 Ladakh is the treasure of picturesque view of beautiful lakes, breathtaking Mountains, and stunning monasteries, but the sand dunes in the Nubra Valley add more flavors to the beauty of Ladakh. 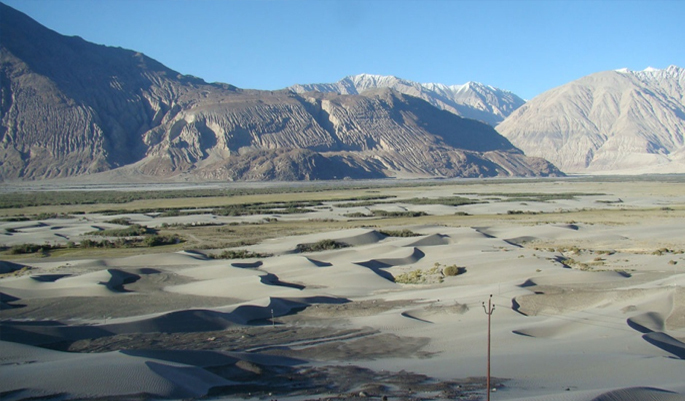 Nubra Valley is famous for white sand dunes, Rock Mountains, and astonishing desert. 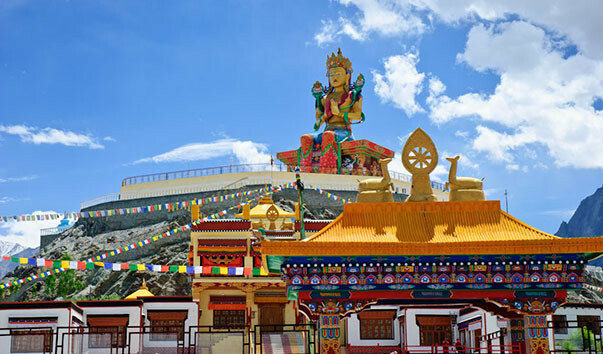 It is around 150 km from Leh city situated at an elevation of 3048 meters. Along the Northern border of India, Nubra Valley is located a little below to Siachen glacier. 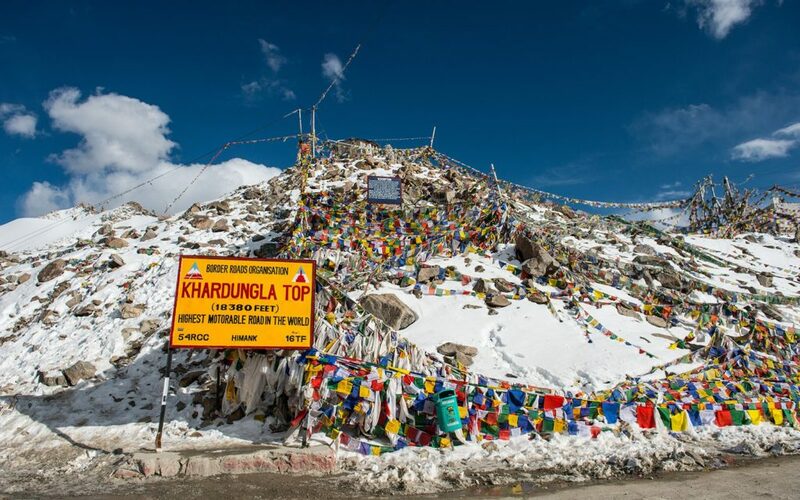 To plunge in Nubra Valley you have to cross one of the highest Motorable passes in the world – “KHARDUNG LA PASS” 5,359 meter. On the way to Nubra Valley, you will get Shyok River afterward which meets to Nubra River. 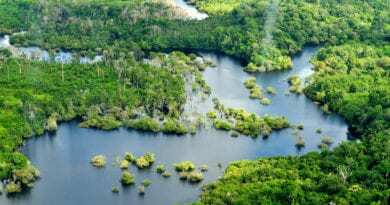 This pristine valley will surprise you with different colors and textures like on one side rock mountains other side green and on the middle coldest white desert. 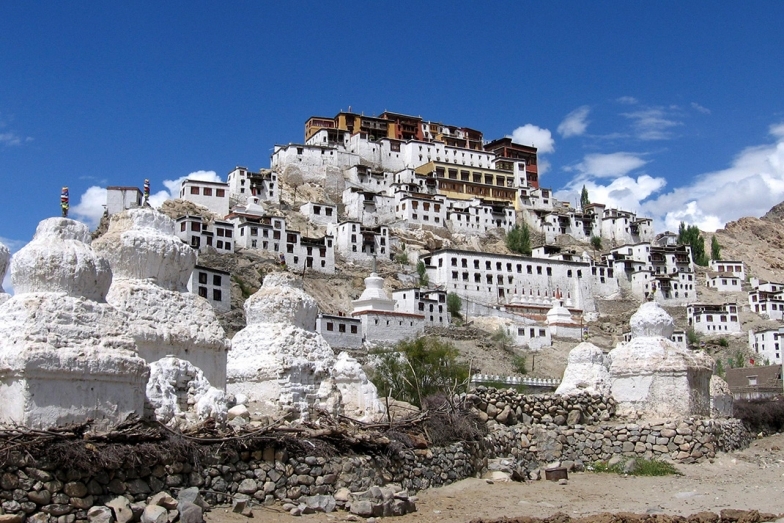 Diskit Monastery will give you wonderful views of Karakoram Range and Hunder sand dunes. Apart from white Sand Dunes, Hunder is equally famous for double-humped camel safaris. Hunder village is famous for the white desert. Until 2010, this valley is open for tourist till the Hunder Village but, from 2011, after the opening of a region beyond the Hunder village gives a tourist the lifetime experience to explore the unexplored ladakhi village Turtuk. If I talk about the trekking then Nubra Valley will satisfy your hunger of trekking. Nubra valley is one of the best trekking expeditions in Ladakh that every trekker lover wants to experience once in lifetime. 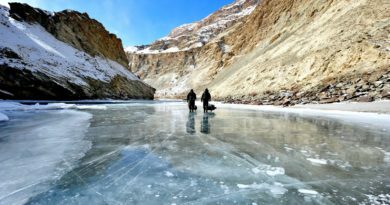 But, Nubra Valley trek is not every one cup of tea as there are many harsh natural conditions which trekkers have to face like, Freezing conditions, strong winds and the Rock Mountains. As the climate of Nubra Valley is mild so this valley is often named as “Valley of Flowers” or “Orchard of Ladakh”. Around 15 km from Diskit near Sumur village there is beautiful blue Lake of Ladakh “YARAB TSO” Lake. You will be impressed by seeing the beautiful shimmering blue lake and it is itself enough to win your heart. After Sumur village around 20 km there is last civilian village and last accessible village for the foreigners PANMIK which is located on Nubra River before Siachen Base Camp. 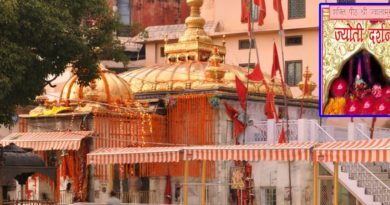 In this village you will be amaze to see the hot water spring and will get a chance to visit 250 years old ENSA GOMPA monastery. You can reach Nubra Valley easily from Leh, via Khardung La Pass but, you will require a special permit to enter the valley which is valid for some period of time around seven days. 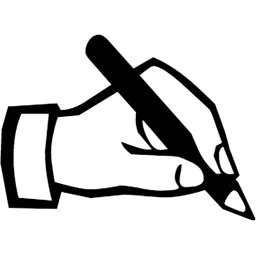 There are many options in Diskit village and Hunder village to stay like hotels and homestays. But if you want to stay in camp then Hunder village is the best place to stay as there are many camp stays in the village. 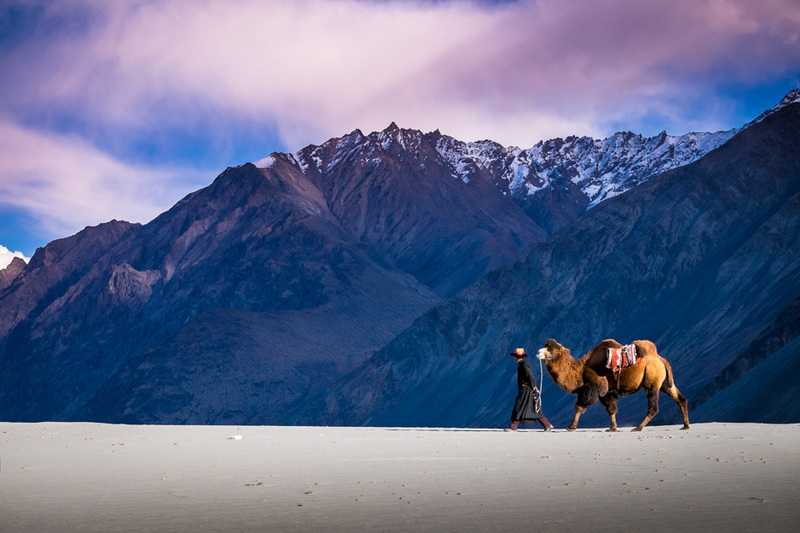 This comming summer plan your trip to Ladakh ladakh Nubra valley and enjoy the Camel safari! Nubra valley is one of the most beautiful valleys that you come across a Ladakh or Kashmir Ladakh tour beautiful landscapes and travel through Khardungla Pass is a lifetime experience, one you visit this splendid destination it leaves along trail of joyful memories.